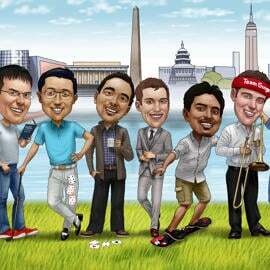 Get a funny and personalized caricature drawing of yourself with your best friend, who will be drawn from regular photo in full body type. Photolamus offers a new idea to draw a black and white caricature of friends, where people can be drawn in favorite selected theme and style, depicting their friendship in a unique way. Such a caricature of best friends will make an excellent memorable gift to your bestie. Upload a photo of you both and get a hand-drawn caricature designed on occasion of Birthday, Professional Day or any other of your choice. Pencils Caricature will be delivered within 5-10 days as a printable JPG File on Email. Pencils Caricature of Friends can be also shipped as Original Drawing on A4 or A3 Paper, Caricature printed on Canvas, Photo Paper or White Mug.